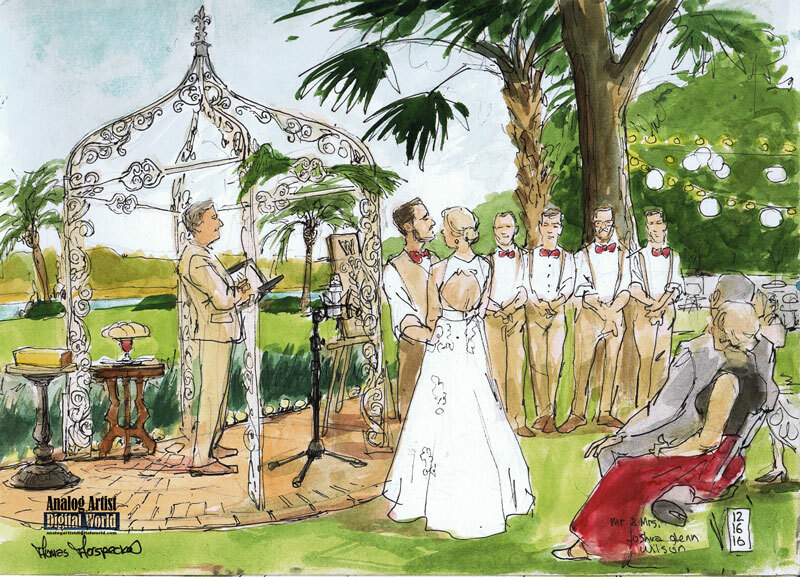 I was hired by Joshua Wilson to sketch his wedding at Wild Acres Villa in Paisley Florida. Joshua is a local pianist and I have sketched him performing at several Orlando events. Wild Acres Villa is locate far north of Orlando in the Ocalla National Forest. The paved road turned to dirt as dusk approached. The Villa is a gorgeous Swiss Chalet made of stone in the middle of nowhere. It sits on the shore of a huge lily pad covered lake. Folding chairs were lined up in rows in front of a half moon brick patio that had an ornate gazebo over it. Pine boughs were stuck into the ornate lattice. A loaf of braided bread sat on top of a cup of red wine. An easel held there ropes with a Celtic W emblazoned across the top of a wooden plank. The ceremony began at 4pm. The pastor and Josh stood waiting for the bride. Bridesmaids walked the grassy lawn and lined up stage right. I had started my sketch, and miscalculated how many bridesmaids there might be. Each time a new brides maid came down the a is she would stand in front of me. I moved each time closer to the stage. The re were 8 bridesmaids in all, and 7 groomsmen. By the time vow we re exchanged, I we standing in a bed of vines. The bread was for a communion for the wedding couple. Josh and the pastor seemed to know one another and they smiled a each other when Cassandra stood at the back of the lawn for the processional, Josh looked at her with adoration. He mouthed silent to someone in the front row, "I'm marrying her. . ." She began walking towards Josh to the sound of Balmorhea by Settler. Josh's face told the whole story. He was overwhelmed and then teared up. This was clearly the happiest moment of his life. The coup faced each other and held hands. I wished I could see her face. Since I w sketching I could only experience this ceremony while watching Josh. The ropes on the plank we re woven into a braid by the couple. This part of the ceremony was inspired by a bible verse in Ecclesiastes. . . "Though one may be overpowered, two can defend themselves. A chord of there strands is not quick in broken." The couple each had personal statements before the a ceremony. The tiny box was for notes that the couple wrote to one another. These notes explain why they were so in love and what they admired in their partner. The box could only be opened in five years or when the couple was experiencing irreconcilable differences. When the ceremony was sealed with a kiss, the lawn chairs were quickly gathered and the photographers work began as they shot large family portraits. Child on ran and played tag, as the sun turned the the tops orange. I walked to the edge of the lake and admired the incredible colors. Tables were already set up on the lawn for the reception. 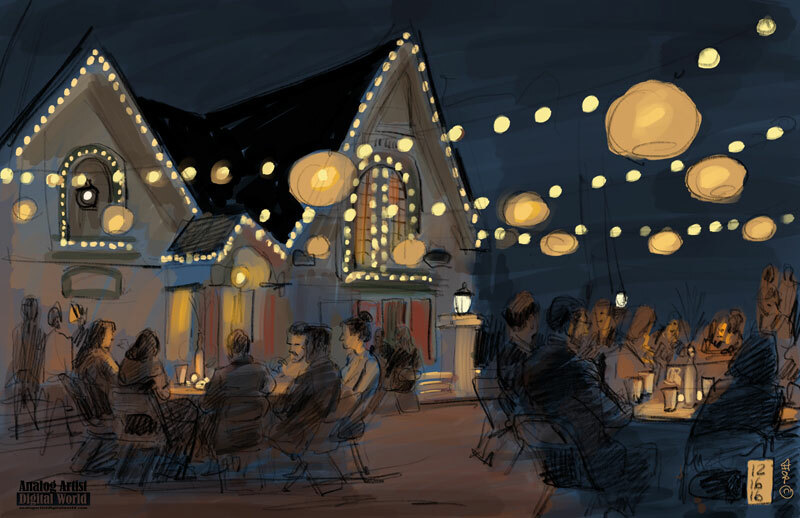 I decided to start a second sketch digitally to capture the illuminated lanterns and the dimly lit guests. I sketched the guests as they sat down for their BBQ pulled pork dinner. The one disadvantage of this wilderness retreat was mosquitoes. Every one was talking a b them at dinner. A photographer offered me bug spray and I slathered some in my ears to discourage the buzzing. Several days later, I discovered the mosquitoes had been having a feast at my ankles. My swollen ankles had never been sucked so dry of blood. With my nocturnal sketch done, I retired inside with the staff to have a bite to eat. I left as the dancing started.